We are celebrating today. 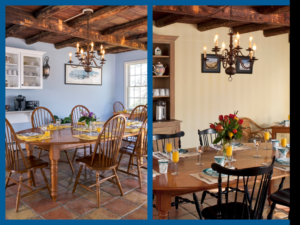 It has been four years since Roger and I became new innkeepers when we purchased the 1802 House Bed and Breakfast in Kennebunkport! Owning an Inn has been something that I’ve always wanted to do. Roger and I would stay in Bed and Breakfasts when we were traveling in the US and I would talk to all of the innkeepers about their experiences. I like to say that I did 20 years of market research before we bought ours. Roger, being the good sport that he is, was always very supportive of my desire to own an Inn. We looked in the UK, but Bed and Breakfasts are quite a bit different in that country. I think it’s changing slowly now, but many are one or two rooms in someone’s home or a restaurant with rooms. Not quite like the US Inns that I was in love with. We even looked off and on at properties over the years. Unfortunately, you’d find a beautiful B&B in a great location and the owners would be living in a tiny dark room in the basement. Definitely needed some space to live our own life! Maine was a state that we hadn’t visited before. So we tacked on a week to see the Maine coast and the fall foliage while on a trip to Boston in October, 2011. Four days in Rockland were nice. Then we had three days in Kennebunkport. I had heard of it, of course, because of the Bush family connection. We fell in love with Kennebunkport the minute we arrived. It’s a lovely little village in this great state of Maine. Good location to Boston so we could get back and forth to England to see the kids (and them to us). Over breakfast at another Inn we were staying at, they told us that if we really wanted to be Innkeepers, one was for sale right down the road and we should look at it. A short visit to the property that day and we flew home the next day and started to buy an Inn! May 9th, 2012 I went to Portland to meet with lawyers and brokers and signed the paperwork to purchase. Roger was still in the UK waiting for his green card to be processed. That wasn’t done until end of August so I spent that first summer here on my own. It was a 20 hour a day job to start with. I’d like to say that it was all smooth sailing, but that wouldn’t be entirely accurate. There was a lot of work to do on the property – much of it that you can see in the before and after pictures (or after and before pictures would be more accurate) in this post. 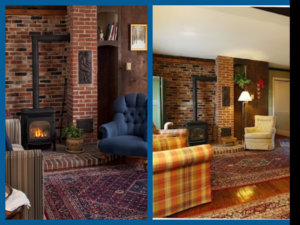 My winter months each year have been filled with remodeling the Inn. Every wall has been painted; we have all new carpets, bedding, mattresses, window treatments and two new bathrooms. Some other things you don’t see, but were equally important. Like removing two 80 gallon electric hot water tanks from the attic over the guest rooms (the one’s from 1992!) before they started leaking through the ceiling. We now have on demand boilers in the basement. From a marketing point of view, we’ve re-branded the Inn with a new logo and website. 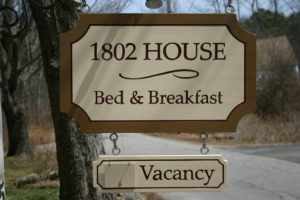 We’ve also become a Select Registry property and are a TripAdvisor five star Bed and Breakfast. A lot of work in four years time, but the results are definitely worth it! We’re just getting ready to start our fifth summer season and I’m very pleased with our decision to take on a major life change, move to the US and become innkeepers. 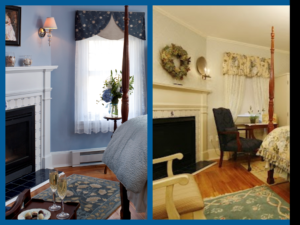 Owning a B&B is everything I hoped it would be. And to all of our wonderful guests that we’ve met in the last four years, we want to thank you for making the journey with us. And a special thank you to all of our guests who return to stay, many of you each year. It’s a real pleasure to see you every time you walk through the door. We wish everyone a wonderful summer and we hope you will visit us if your travels bring you to Kennebunkport.